Greetings to all participants gathered together at this 11th AEPF in Ulaan Baatar. Once more representatives from civil society groups across Asia and Europe are gathered together for another Asia-Europe People’s Forum. Two years ago I was in Milan at the 10th AEPF recalling Sombath Somphone’s role and engagement in the 9th AEPF in Vientiane and his optimism and vision of seeing civil society groups, working alongside governments and businesses to support the fostering of more inclusive and sustainable societies across Asia and Europe, and especially for Laos. Unfortunately, Sombath’s aspirations and expectations of a safe and inclusive space for civil society engagement and debate were misplaced. Two months after the 9th AEPF Sombath was disappeared right in front of a police post in Vientiane, with his abduction clearly recorded by the Lao police surveillance camera. Now, nearly four years later, Sombath is still missing. His abduction has been acknowledged world-wide as an “Enforced Disappearance”, and his case remains open at the UN Working Group for Enforced Disappearances, as well as at the UN Universal Periodic Review. To all the questions and calls for accountability of Sombath’s abduction, the Lao Government has stubbornly maintained the position that the state is not involved, and the police are still investigating. To seek resolution to the case of Sombath Somphone’s disappearance. Seek resolution to the case of Sombath Somphone’s disappearance. 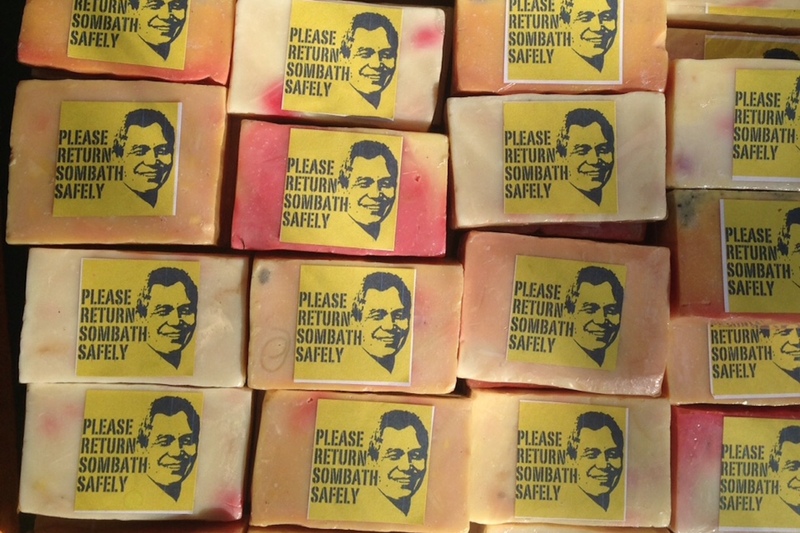 Proper resolution to Sombath’s disappearance require many actions. The Sombath Initiative manages the Sombath.org website, as well as TheSombathInitiave pages on Facebook and Google + and The SBInitiative on Twitter, to inform the public of who is Sombath Somphone, his life and work, media reports of his abduction, actions taken by various parties regarding Sombath’s disappearance and how to get involved. I have also worked tirelessly to make sure that what happened to Sombath is shared with people from across the globe. I have given numerous talks at various symposiums, conferences, and meetings, and was interviewed by countless newspapers, journals, and media outlets. I have also met with diplomats in the field and head offices from European and Asian Countries to urge the Lao Government to resolve the case quickly, transparently and accountably. But mine is a lone and weak voice. I hope you will support the Sombath Initiative in whatever capacity you can and join in our effort to campaign for his safe return and justice for Sombath and his family. Sombath’s disappearance is clearly a criminal act and a human rights violation. Laos has claimed that it is a country governed by rule of law and that all Lao citizens have rights that are guaranteed by the Constitution. Internationally, Laos has also acceded to nearly all the international human rights conventions, and has also signed the UN Convention for the Protection of All Persons Against Enforced Disappearances. For these reasons, it is all the more important that the Lao Government act with integrity and honesty and resolve Sombath’s case with immediate urgency. Recently, I have been asked, “How hopeful are you that Sombath will still come back?”, or even more bluntly, “Do you think Sombath is still alive?”. To such questions, I only have this to say, “I remain hopeful that he will come back to me alive.” I get up every day in the hope that Sombath will come home; I draw each breathe in the hope that Sombath will come back! I must have hope, for what is there left for me if that “hope” is taken away? But I do have a major fear; my greatest fear is that with the passing of time, his disappearance will be forgotten. I am realistic – everyone is busy with their own life and work; they have families to take care of; they have careers to pursue, and they have other interests or other causes to engage with. It is natural that people forget – sometimes even I want to forget, but I can’t. For me it is personal; but for others I cannot begrudge them; I can only hope that all people working for justice, truth, and a better world for themselves and for their children do not forget, “Sombath is still missing”. I also especially hope that participants at this AEPF11 will take some time to reflect and recall what Sombath had stood and worked for. Sombath gave his all to the AEPF9 in Vientiane, believing that with a successful AEPF held in Laos, Lao civil society groups would benefit from the experience, learn and share ideas and perspectives on how to be a positive force bridging the perspectives of government sectors, civil society groups, and businesses, and jointly and consultatively work for betterment of their societies. All Sombath wants to see is that the development processes and benefits are more inclusive, equal and just for all. Unfortunately, Laos may not have been ready for such open dialogue. I believe it was due to Sombath’s high profile engagement and involvement at the AEPF9 that had provoked his abduction! Equally important for me and also his close associates and colleagues, is that Sombath’s vision and lifework on participatory, sustainable and “people-centered” development should not disappear. Sombath’s development vision and aspiration did not come from theory but are learned from direct experience of growing up in a poor rural family and working for over the past 30 years in communities all over Laos. His ideas and approaches are not shaped by any political or development imperatives from outside or from above; they have been learned from consultative partnerships and practical experimentation with the communities and families, with teachers and students, and monks and nuns in schools and temples. He listened and worked with the people; he did not talk down to the people and did not blindly mimicked development ideas from outside or from above. Sombath, through the course of his work has inspired thousands of young people. They have been trained in practical life skills and leadership skills through community living and service programs conducted for over 15 years by his organization, PADETC (Participatory Training and Development Training Center)”. Sombath always urged the young people to remain mindful of their country’s traditional values even as global forces grow stronger. Development is good, he assures them, but for development to be healthy, it “must come from within.” That was what made Sombath’s work so authentic and so trusted by those he worked with. In preparing for this talk, I looked back on many of Sombath’s writing and notes on his development approaches and thinking. I am continuously struck by how relevant and how important they still are, especially when it is becoming more apparent and clear now that past and ongoing development and political mistakes are the root causes of many of the current political, social, economic, and religious fissures across many societies in Asia and Europe. We are today living in a much more destabilized world where the social fabric of our communities have become even more frayed by hate and distrust. Sombath in his speech also offers some possible solutions for action. He says, “Getting out of this dangerous stalemate requires three major changes. First and foremost, it is necessary to transform the present power structure. We cannot afford to allow the big corporations to continue dictating to our governments the kind of investments they should make. And we cannot continue to have governments continue to listen to the power of money over the voices of the people and civil society. These three parties – the state, corporation, and civil society should work together on a more equal basis and with mutual respect and shift the course of development on a more balanced course. This should be done regardless of whether we live in Laos, Asia, Europe, or any other continent. We can start by creating allies among CSO’s locally, regionally and internationally. We can create allies with sincere people in governments and in the corporations who are not just blinded by power and money and not just concerned about the next election or the next financial year, but are interested in the long term good of society. Secondly, we need to shift our thinking and to adopt a different model of development. This new model should stress the balance and the interconnectedness between the four dimensions or pillars of development, namely: the Economy, Nature, Society, and Governance. Thirdly, we need to give more space for the ordinary people, especially young people, and allow them to be the drivers of change and transformation. Ordinary people, not politicians, not the rich, and not CEOs, form the majority population in any society and hence how society develops need to take into consideration their needs. Listening to voices of the young is especially crucial. The young are already looking for ways to channel their energy and to have a sense of belonging. Their ideas and aspirations for sustainable development should be given due consideration, after all the future should be theirs to make. To shape the future they need to be part of the planning of the present, and learn from the successes and mistakes of past, and from the adults”. I hold to the hope that the organizers of the AEPF and participants of the AEPF will not let the passing of time forget Sombath’s contribution to the development dialogue which I think is very relevant to this year’s theme, “Building New Solidarities: Working for Inclusive, Just and Equal Alternatives in Asia and Europe”. The key words, “building solidarities, working for inclusive, just and equal alternatives”, I believe is what Sombath is also alluding to in his opening speech at the AEPF9 in Vientiane. Let’s not let such aspirations remain as “buzz words” only, let’s work to realize these for the people in our own societies. Let’s build allies of like-minded groups and people, and let’s not forget that Sombath is also one of your key allies and your friend who has paid a heavy price for his beliefs and who is still disappeared. For a start, I hope you will show solidarity for Sombath by continuing to take a clear stand on Sombath’s disappearance with the Heads of States in the upcoming ASEM on 15-16 July 2016. AEPF11 must demand that ASEM hold the Lao Government responsible and accountable by quickly revealing the results of the investigation on Sombath’s disappearance and to tell the world the truth of what happened to him. The Heads of States of ASEM cannot allow for continued inaction on the part of the Lao Government and allow for such impunity to go unaddressed. Going forward, I also urge our friends and partners of AEPF to continue to show your support and solidarity to me and to the Sombath Initiative by campaigning for Sombath’s safe return and by continuing through your work to realize Sombath’s dreams and lifework for a better world for all. I believe Sombath’s dreams and aspirations are also the dreams and aspirations of the participants here at the AEPF11. Thank you and I wish you all a successful AEPF11. Dear Shui-Meng, I am Reiko Ogawa who used to work as a program officer at Toyota Foundation which supported Sombath’s PADETC’s project. I always had a pleasure to dine with Sombath whenever I was in Vientiane. Once he invited me to his home party where I got introduced to you in your beautiful garden and that is how I remember you. I left the foundation in 2004 because they decided to close down the Southeast Asia program and since then I did not have a chance to go back to Laos. Sombath has always been in my heart and I have been very very worried about his whereabouts. Please keep me posted with the information and if there is anything that I can do please let me know. Previous PostPrevious Is the Upcoming ACSC/APF a Safe Space for Independent Lao CSOs?